Made from SA steel. They offer comfort and smooth handling. They are available in different tips and angles for specific jobs and they have a satin antiglare finish with an ergonomic design. 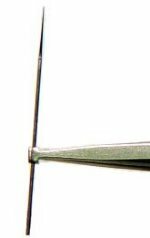 Straight "T" shaped tips with a vertical groove inside for holding cylindrical objects up to 1mm diameter. Length: 4¾" (120mm). Absolutely perfect for holding and installing Omniprobe Tips (sold separately). Especially if you're using Cryo-lift out and have to install the tip with the rod already inserted into the SEM chamber. Forceps provide a firm grip and longitudainal stability reducing the chance of dropping the tip.